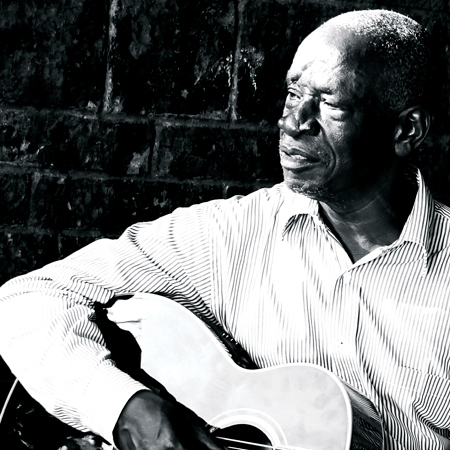 In the month of May 2015 during his East African tour, I was lucky to catch Dar es Salam’s Leo Makinya in between sessions for a new song off his yet to be titled album he was recording at Ketebul Music Studios and the busy artist was able to grant me an interview. 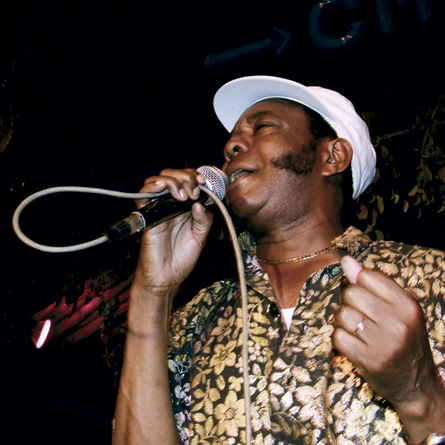 The self-professed Swahili Blues singer spoke to me more about the sounds that shape his music and the album he is working on. At what point in your life were you sure that you wanted to do music as a career? I was playing with a guitar like a toy when I was a child, watching as my father and his friends played and I grew up thinking every human being could play the guitar. As I got older, I realized this was not the case when I asked some friends if they could play the guitar and they responded no. It’s easy, I said. Yet not everyone could play. I would later take the art professionally. 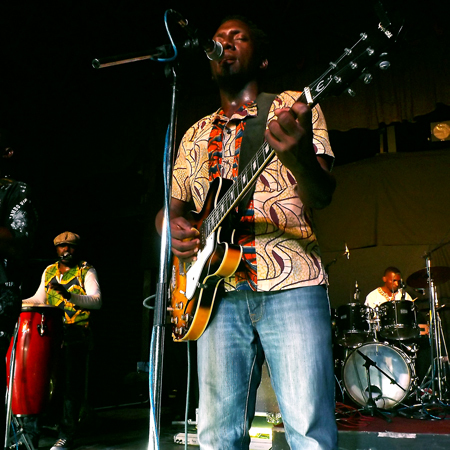 Why do you call your music Swahili blues? I call it Swahili blues because it’s a mixture of Swahili songs with blues elements. I came up with this genre after I found out the music from Tanzania is purely typically blues but no one calls it that. 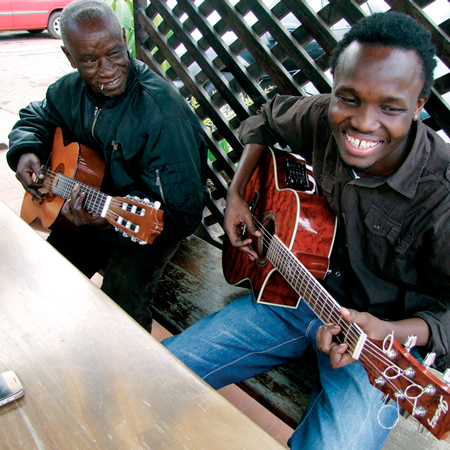 The way we sing and the way we play our local instruments sound very much like blues so I decided to name it that as I compose my music in Kiswahili language and adopt the styles and rhythms from my tribe back home in Tanzania and use them on guitar chords. This is how my music sounds the way it sounds: jazzy and bluesy. 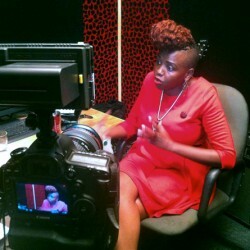 Why did you choose to work with Ketebul Music over any other label? 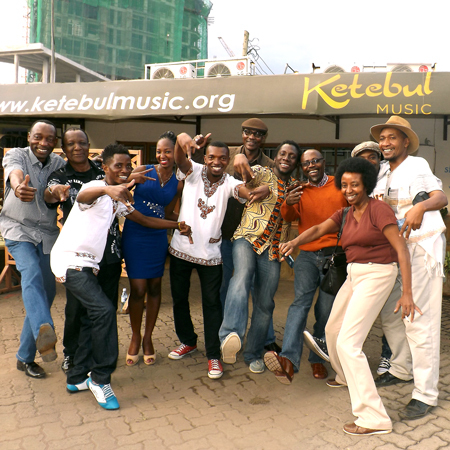 How did the whole Ketebul Music collaboration come about? How did you meet each other? Well Ketebul understands my music deeply and what I’m doing (laughs). 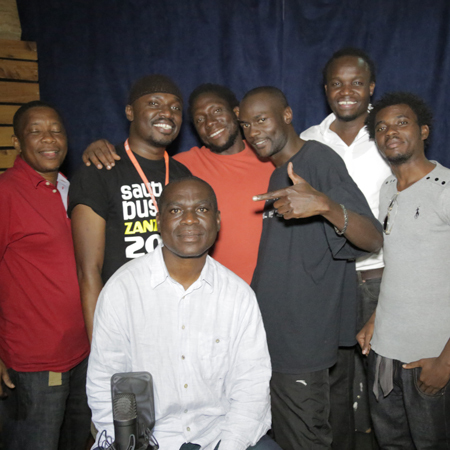 When I met them they understood me well and gave me this opportunity to produce and record my CD here. So I thought, that’s a beautiful opportunity! Let me use it since I don’t get to record much back home in Dar es Saalam. I first came to Nairobi in December of 2014 and I visited Ketebul Music with my music on a flash disk. I met the director of Ketebul Music, Mr. Tabu Osusa and introduced myself to him. I asked him if he’d listen to my music, which he did, and he liked it and he said: ‘’the music is good’’. We did interviews around and we did one recording at Ketebul Music. I then left and returned home to Dar es Salaam. I later got booked for Sauti Za Busara in Zanzibar and some events in Nairobi and also in Ethiopia. After all these concerts I got the opportunity to record here (Ketebul Music Studios) so that’s what happened. This album from my point of view is going to introduce Swahili Blues to the world. Taking into consideration that you’re recording this album in Nairobi and not in Dar es Salaam, do you think the influences on your sound may affect your fans back home? There are many influences; Kenyan, Ethiopian, Tanzanian, my mum’s tribe and my dad’s tribe. So it’s like a mixture of all these because that’s the life that I’m living. This CD is a representation of my life. In some songs I’m talking about Ethiopia and I even add some Ahmaric just to spice it up and make it more interesting and not rigid. The influences are definitely there in a very positive way. You mentioned Addis and other East African cities in your songs, what inspires you to write these songs? And you left her for another woman in Nairobi? No no no (chuckles). My lover from Zanzibar got lost in Nairobi. The wakora took her away. She got lost on Ngara Road. The wakora took her away to Dandorah. I use the word salaam which stands for ‘peace.’ Dar es Salaam Mombassa salaam, Nairobi salaam, so I’m trying to promote my cities and invite people to visit these places because you never know where these songs will be played and may attract someone to visit. What are some of the topics you touch on with your songs? The songs touch on every aspect of society. I have a song about Africa and bad leadership; there are songs about unity and promoting the youth to be together, repatriation to build nations back home in Africa; in some songs I’m talking about female genital mutilation and so on, so it’s filled with matters that affect the society and love is one of them. 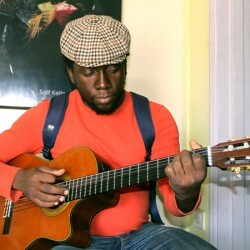 Leo Makinya is a very down to earth person and well grounded in the roots of his homeland and his traditional vibes. I had the privilege of listening to some of the songs he’s recording at Ketebul Music, and I would describe his sound as African pop meets traditional Tanzanian rhythms such as Segere. This storyteller weaves his stories poetically, expressing his ‘blues’ for the ills in our society. For example, in one song he dwells on the tumult of Africa and his love for the environment. The anti poaching song describing the plight of elephants in eastern Africa where they are hunted for commercial use of ivory. 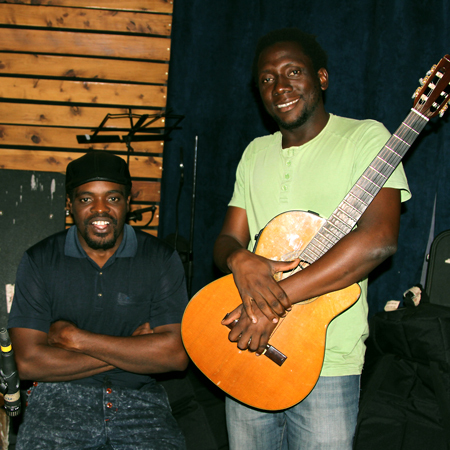 The songs are recorded with live instrumentation played by some of the top session musicians in Nairobi. 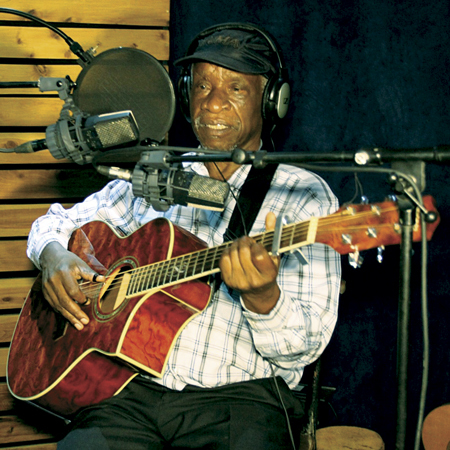 Leo employs a call and response style of singing on some of the songs, which is typical in most African traditional styles. His voice is very smooth and is complemented well by the musical arrangements, which sound, funky, mellow with very rhythmic grooves yet still very danceable. Leo has good chemistry with the people involved in the project and is doing a lot of experimentation and collaborations on this album. He has featured artistes from the Ketebul Music stable like Makadem, Winyo, Akuku Danger and has also recorded a duet with Nyota Ndogo. This album promises to be a must have collection, and I’ll urge you to be on the look out for it! Over the past 3 weeks Ketebul Music in conjunction with KBC TV have been airing our Retracing series of documentaries. These are aired as a 13 part series every Sunday at 5:30pm on KBC channel one. Stay tuned on Ketebul Music website and social media for updates and extracts from the Kikuyu popular music edition, and be sure to join us this Sunday at 5:30pm on KBC Channel One for the first installment of this edition. 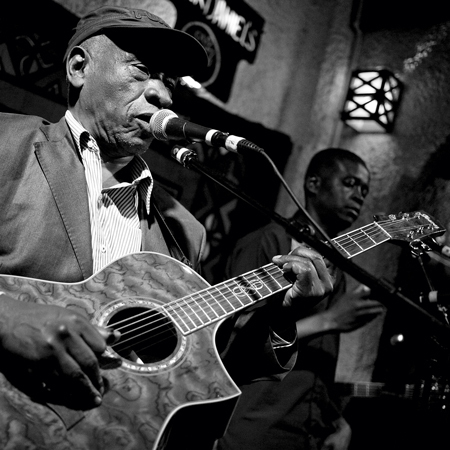 We at Ketebul Music, on behalf of the Kenyan music fraternity and all lovers of benga music regret to announce the sudden passing of veteran musician Ochieng’ Nelly Orwa. Ochieng’ died on Wednesday 30th April at Kenyatta National Hospital where he had been rushed by family and friends. Ochieng’ was one of the two surviving members of the original Ogara Boys Band of the 60s which was led by John Ogara Kaisa. 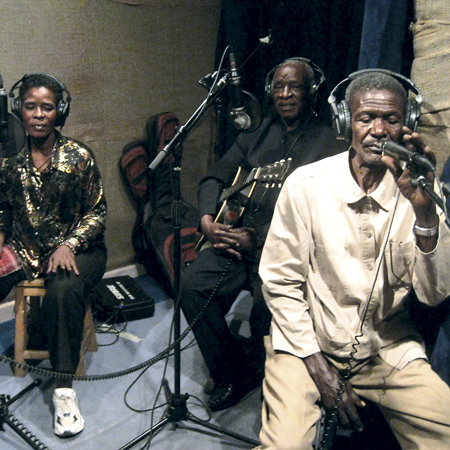 This trio, which also included Akech Oyosi Jabuya, are credited as being the pioneers of the old school benga sound. His passing is especially regrettable coming at this time when we were in the middle of preparations for the upcoming Smithsonian Folklife Festival to be held in Washington DC in June, where Ochieng’ was scheduled to perform. 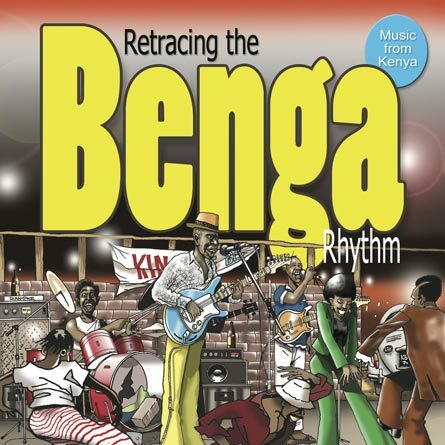 Ochieng’ Nelly was not just a veteran but an important influence to the younger crop of musicians who wanted to master the art of playing benga music. 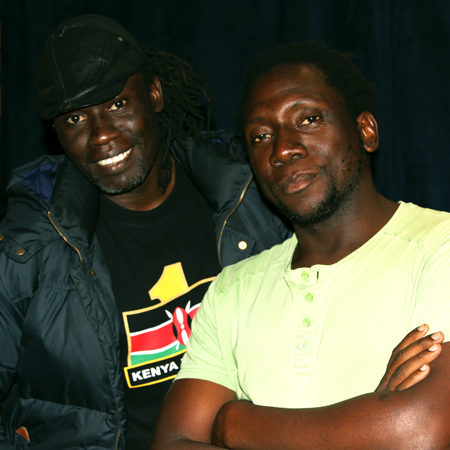 Shiphton Winyo, Akuku Danger and Eddie Grey are some of the younger generation of musicians who have benefited from Ochieng’s influence and mentor ship. One of his recent projects was a collaboration with the rap duo of MC Matre from the US and Paleface from Finland on a studio recording which they were set to release. The joke at the studio was that he should start donning bling bling and practicing walking with a rapper’s swagger. We obviously didn’t know he wouldn’t live to see the project come to fruition. 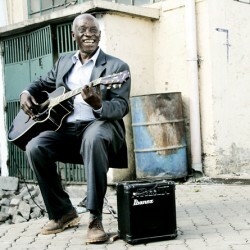 After a chequered musical career that span five decades, Ochieng’ was making a successful comeback to the live music scene and festival circuit. He had secured 14 confirmed bookings to tour Germany, Holland, Belgium and France in 2015, a tour that now has to be cancelled. The French tour follows a series of recordings he did with Radio France International last year. Ochieng’ had also been booked to perform at the closing of the DOADOA music market which will be taking place in Jinja Uganda in May 2014. He was also keen on re-recording and introducing to the younger generation popular old music from the 1950s by such greats like Olima Anditi and Lango Obiero. 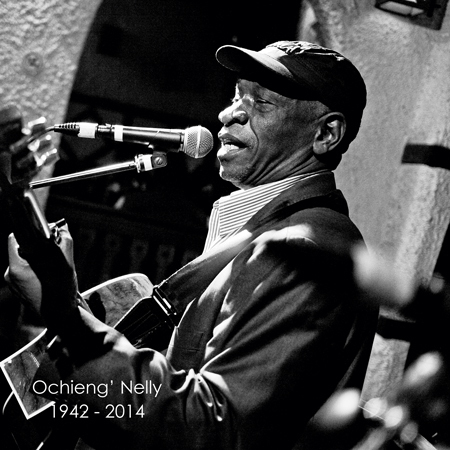 The passing of Ochieng’ Nelly should remind us of the importance of researching and documenting Kenya’s rich and diverse cultural history in order to assist the youth in developing a sound that truly reflects and captures Kenya’s identity. Our condolences go to the members of his family. Owing to the fact that it is the first day after the weekend and the beginning of the ‘official’ work man’s week, Monday is normally viewed in sort of a negative light. With terms like ‘Monday Blues,’ in reference to having to get over the effects of an easy going weekend, Mondays are dreaded by both young and old be it in school or the work place. Well, in an effort to break the ‘Monday Blues’ stigma, and to give you a positive outlook to the day, we would like to welcome you to Musical Monday(s)! We will be featuring stories, music and profiles of musicians and artistes that we like. This will not be a critics review, but just us pointing out the music we like: more like a musical compass pointing you out to the ‘right’ direction from our perspective. To start us off this Monday, we will feature the group Sarabi. Sarabi is Swahili for Mirage. It also means, Imagination, Vision and Creation. They describe their music as a vivid representation of our society, and influenced by the everyday happenings. 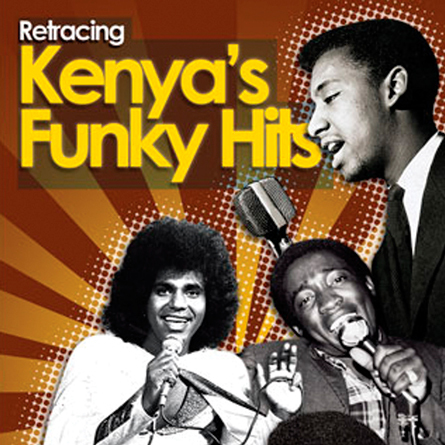 It features traditional Kenyan rhythms, Benga and a blend of Western sounds. 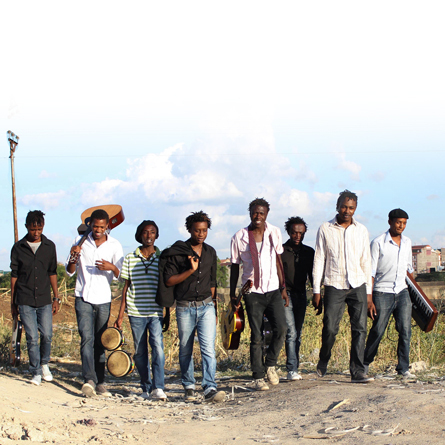 Sarabi was formed in 2005 and has in the recent years emerged as one of the most exciting and sought after bands in Kenya. The Band is made up of 8 young men, hailing from the Eastlands area of Nairobi, who started playing music before they were even teenagers. They have worked together and grown into an accomplished and solid band, with very high levels of professionalism, that is sometimes lacking in bands who are even twice their age. 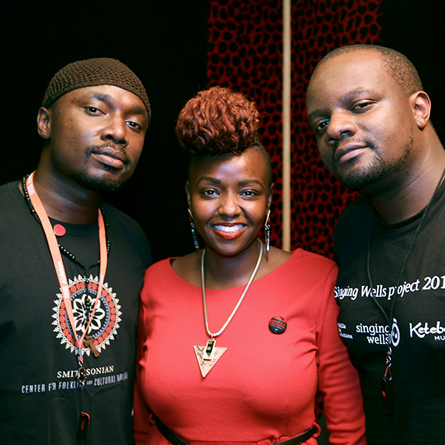 They have been described by the press as “The next force in Kenyan music,” (Drum Magazine, Oct 2007) and as being “The new face of AFRO-Fusion in Kenya” (BUZZ Magazine, August 2013). 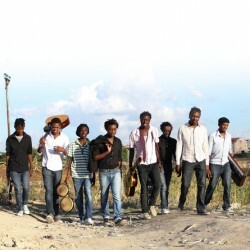 Sarabi released their debut album titled “OYAORE”- A new beginning in July 2013. 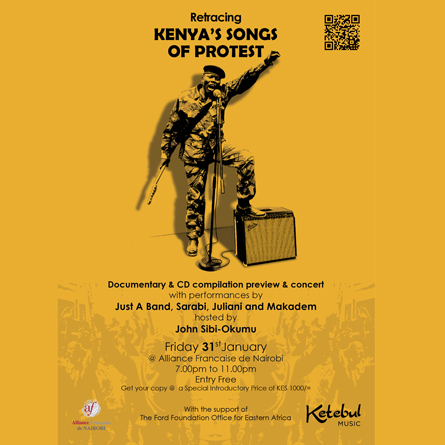 They will be on stage this Friday the 31st of January 2014, performing at the launch of Ketebul Music’s Retracing Kenya’s Songs of Protest. Be sure to join us and catch Sarabi live on stage where they will perform Fwata Sheria among other of their popular songs. We dedicate our Thursdays to reviewing and revisiting our past projects, events and generally things we have been involved in. 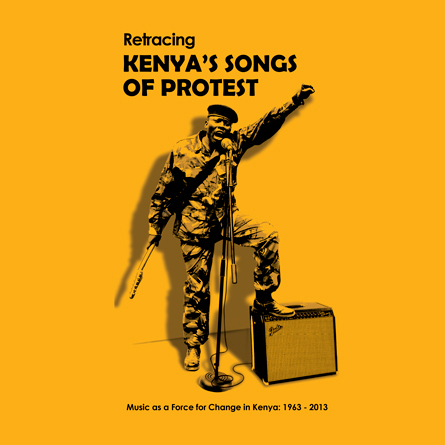 Today, as we are gearing up to release our latest edition of the Retracing series titled Retracing Kenya’s Songs of Protest, we shall revisit one of the earlier editions in the series: Retracing Kikuyu Popular Music. 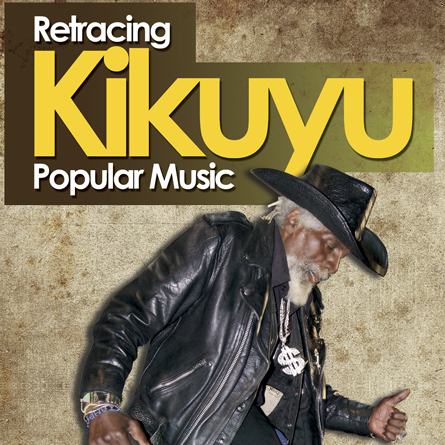 Retracing Kikuyu Popular Music is the 2nd edition in the Retracing series. It was officially released on Friday 17 December, 2010. The launch was held at Alliance Francaise de Nairobi and included a concert that featured performances by non other than the legendary musicians Joseph Kamaru and DK Mwai. 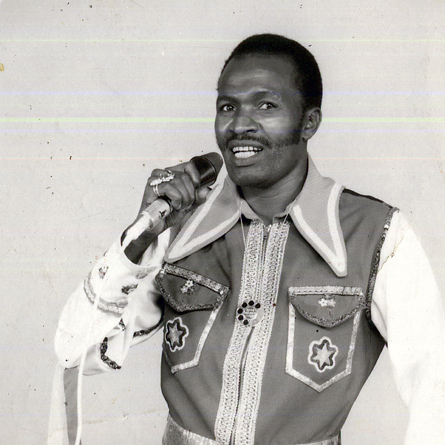 Why did Gospel music become such a big part of Kikuyu popular music? 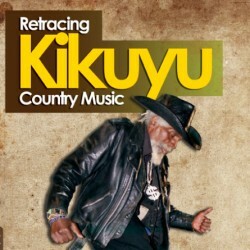 Is it true that there is a Jim Reeves, Don Williams or Kenny Rodgers cassette in the home of every music-loving Kikuyu? How did the name of the American “father of country music” – Jimmie Rodgers – come to be inscribed in the spoken idiom of the Kikuyu of the 21st Century? 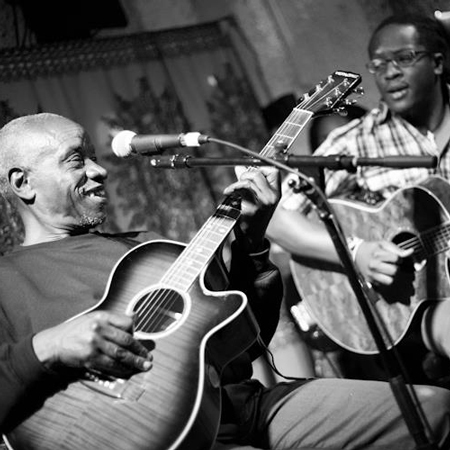 Why does Kikuyu urban guitar music carry the riffs of American country music? Why do virtually all Kikuyu popular musicians wear American Stetson hats and Denim suits, and occasionally, a leather jacket and studded belt? Retracing Kikuyu Popular Music takes a journey into the roots of Kikuyu music tries to answer these and many other questions. 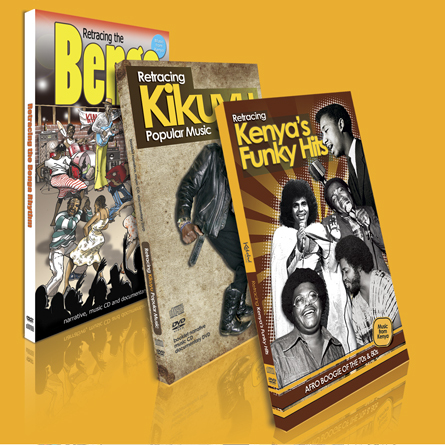 The answers may not be straightforward but in trying to unlock the riddles, Ketebul Music avails part of the archive of Kikuyu popular music in new and accessible formats.